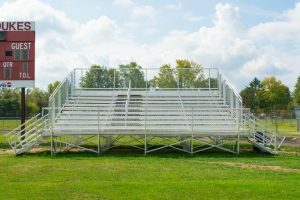 Sightlines Bleachers’ Aluminum Benches are the perfect solution for players, spectators, and visitors who wish to have safe and comfortable seating for sporting events and other occasions. Our aluminum outdoor benches are guaranteed safe, durable, and can meet a wide variety of needs. • All of Sightlines Bleachers benches eliminate the splinters, rust and painting required by similar wooden benches. Our maintenance free aluminum benches will last a lifetime! • Sightlines Bleachers has over thirty bench models to choose from, from aluminum sport benches to park benches. We have a bench that will fit any need. • Sightlines Bleachers portable bench models are designed for easy mobility. Permanence can be achieved with our benches by bolting to the floor. • Sightlines Bleachers permanent bench models are designed to be embedded into concrete for any site where a need for permanence is required. • Choose from Sightlines Bleachers benches with back, benches without back, permanent, portable, benches with storage shelf, scorers tables, double-wide benches and many more.